Are you looking for archery elk hunting tips? If so, you’ve come to the right place. First, consider your bow set up. While deer hunting bows work well for archery elk hunters, you can adjust your bow to make it work even better to get elk. For instance, go for heavier broadheads– 100 grains is a great weight to work with. Moreover, choose any brand name fixed blade broadhead. If you’re thinking about utilizing an expandable broadhead, do some research and talk with fellow hunters to determine what would work best for elk hunting. Next, consider that elk are bigger and slower than deer. Therefore, you’ll require more kinetic energy to bring an elk to the ground. Consider using mid-weight or heavy arrows that match up well with your heavier broadhead. Pull as much weight as you possibly can, and avoid cranking your bow past its recommended poundage. Did you know this: proper shooting form is more important than poundage when it comes to getting a good shot? Even if you have “the right” arrow weight, broadhead type and speed, you’re not going to hit your target if you don’t place your shot properly. Therefore, it’s important to practice placing your shot before you actually go and do actual elk hunting. When you practice, do so in the manner you plan to use in the field, which could be from a blind, a tree stand, and/or stalking the animal. You might have to get down on your knees to practice. You might have to try shooting at odd, steep or uphill angles. 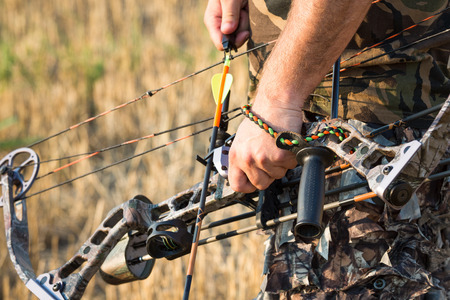 Basically, try out as many possible situations and positions as possible during your practices so that you’ll be more prepared to handle the actual hunt in a successful manner. How about judging your shot distance? Ideally, using a range finder can help you with this aspect of the archery elk hunt. Most shots are made at 40 yards or less. You should practice shootings within those parameters, and every once in a while try at 40 yards or more, too. Finally, keep this in mind: elk are big creatures. You might think you hit ‘em and they’ll fall down, but that’s not always the case. Elk have large, hard scapula bones which arrows can’t easily penetrate. So, aim for the top lower third of the body, right behind the leg for a high heart, double-lung shot if you want to get ‘em. Samuelson Outfitters offers guided archery elk hunts in Colorado; call 970-726-8221.